This post was sponsored by Supreme Source Grain Free Cat Food as part of an Ambassador Program for Influence Central and all opinions expressed in my post are my own. As you all know the Farm cats are very important to me. They are my comfort when I don’t feel well. When I am feeling down one of them will do something silly to make me laugh. Since they play such an important role in my life I do my best to give them the best food that I can. 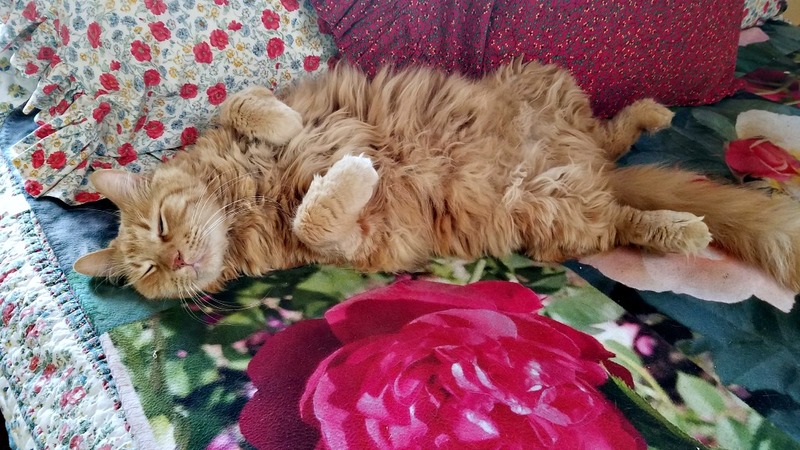 Grain free cat food has been the kibble option for a while around these parts and I’ve recently learned of a new food – Supreme Source® Pet Food. The Farm cats are used to going out and running about the Farm. Harry as you all know is a prodigious hunter. 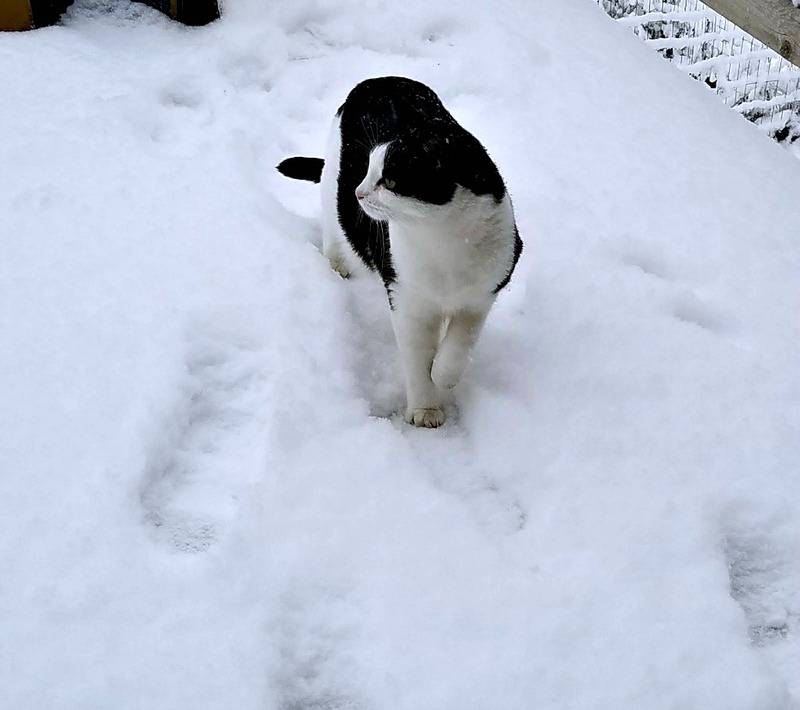 But since they are also somewhat pampered “Farm” cats they have a bit of a dislike for well, winter. They would rather it go away completely. Some of them still go out but generally react like – where is my world and what have you done with it? Due to this their activity level declines. I don’t want them to turn into chubby kitties so I make sure to keep them active inside with a variety of toys and playtime. Erm, Sherpa! That means you! That is not what I would call active time! To keep them healthy all year long, no matter their activity level I feed them a quality food. A good, balanced diet is so important to overall cat wellness. Supreme Source Grain Free Cat Food is full of enzymes and probiotics that make it a superfood for your cats (They also make dog food too for those of you with canines.) It has no corn, wheat or soy as well as no artificial flavors or colors. We humans like to eat as healthy a diet as possible so why not use that same philosophy for our beloved pets? As the company says, ” Our passion is creating safe, nutritious, delicious foods that your cat is sure to love.” I felt this was a good food to feed the Farm cats. And for Kitty the feral farm cat. He deserves good food too – even if he won’t let me pet him. 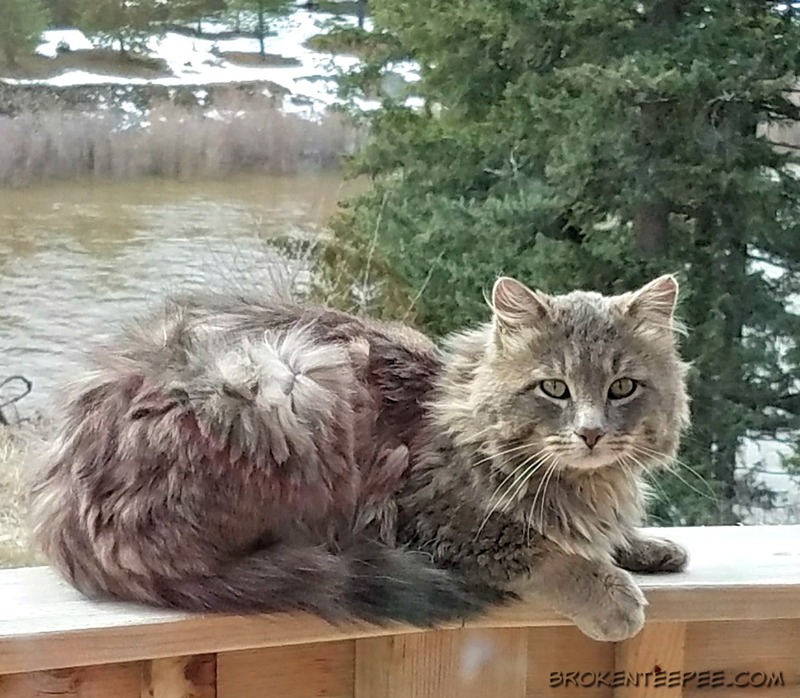 I set about working with Supreme Source grain free cat food and the Farm cats on a 10 day detox program to transition them to a new food and keep them active. It’s never good to abruptly change your pet’s food. And of course it’s always best to check with your veterinarian for any major changes in your pet’s life. 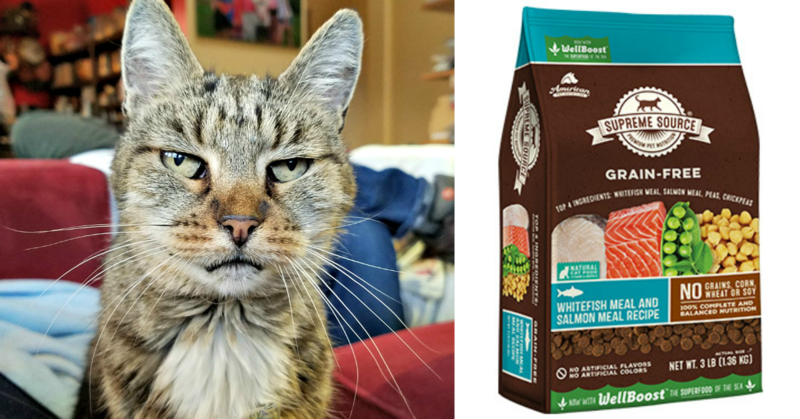 We bought the Supreme Source Whitefish Meal & Salmon Meal Dry Cat Food to try out! You can improve your pet’s mind, body and soul too! This spring, if you go to Superfood Switch you will have access to a coupon for a free bag (up to $9.99, while supplies last) of either cat or dog food. You will also be signed up for daily emails with tips to help you work with your pet through the transition. So why not start your pet’s 10-Day Detox today? Cats need active time. I know there are those statistics that tell you cats sleep 16 to even as many as 20 hours a day. It is a part of their nature especially as they age. But that doesn’t mean that they don’t need exercise when they are awake. In fact, just like humans cats need to move to be healthy. There are several things you can do for your furry friends to help them keep active. Several of them are fun for you too! 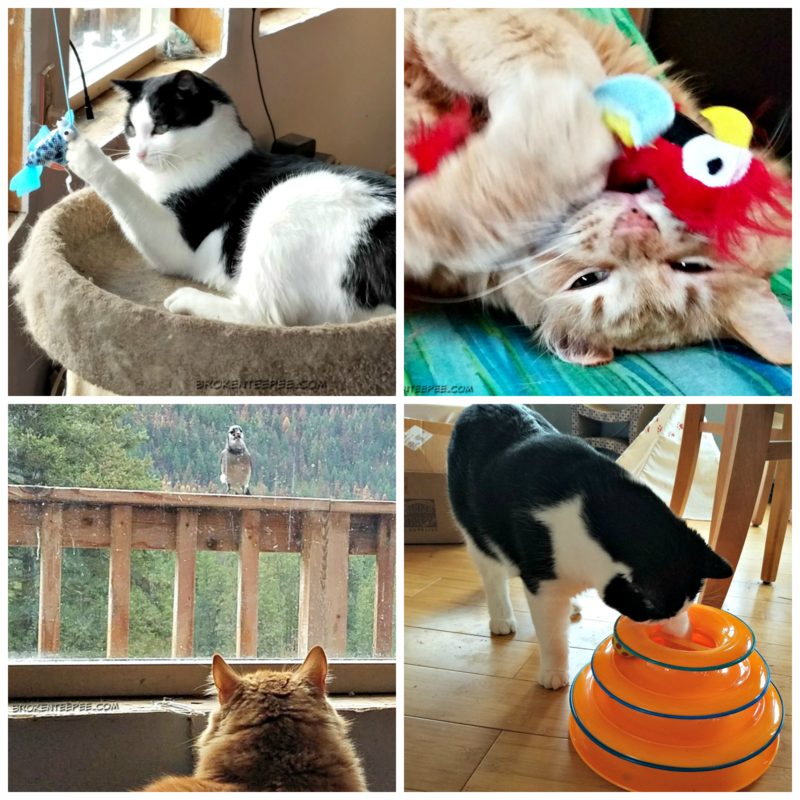 You can’t be with them all of the time but you can do things to keep their cat brains busy. Catnip toys are different from their fetch toys in that they usually just roll around on the floor in paroxysms of joy. Not all cats react to catnip but you won’t know if yours does until you try. 2 out of 4 Farm cats get nippy. Bird TV is not available everywhere and I am not sure the Farm cats realize how lucky they are to have such unobstructed views to this channel. Although I am aware that some humans will put this channel on the real TV or computer for their cat’s enjoyment. Here on the Farm they just have to pick a window. I am sure that you want what is best for your cat (and/or dog) so why not head over to Supreme Source and check out their grain free foods? Print off that coupon for the free bag of food as I outlined above and sign up for those great tips to help you transition your pet. The Supreme Source Grain Free cat food is available at many grocery stores like Albertson’s and Safeway. You can use this easy store finder on the Supreme Source website. The Farm cats will be switching to Supreme Source. They will share their experiences at a later date. Stay tuned to see how the Super Food Switch worked for them.